He chews bubblegum onstage. He sings the theme from "The Flintstones" during his drum solo. A box of crayons inspired the colors of his Yamaha Beech Custom kit. But Slam-G's says that being Britney Spears' touring drummer isn't kid stuff. In fact, the 37-year-old fusion and gospel veteran insists that the enforced simplicity of the gig has improved his musicianship. "I'd always focused on my chops," he explains. "I could play really fast, but my groove was suffering. But when you can only play 2 and 4 on the snare, you have to learn how to make 2 and 4 as funky as it can be. Now I've got my pocket right where I want it." Slam-G's (a.k.a. Marvin Hammett) has played on a Yamaha set before much of his current audience was born. "On the first Yamaha kit I picked out," he recalls, "I just kicked the bass drum, and I'd never heard anything so warm and round in my life. I didn't even have to hear the rest of the set - I knew I was going to buy it." 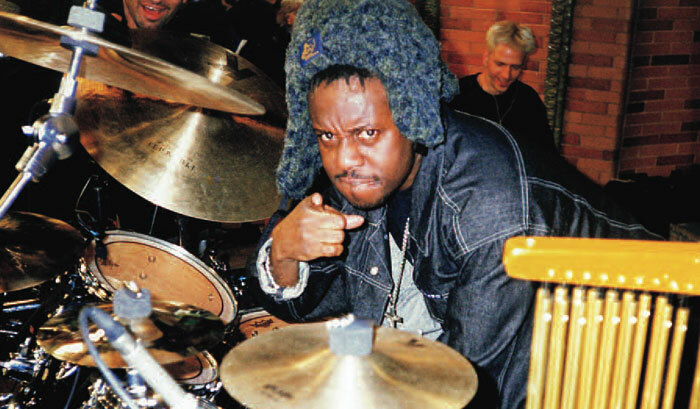 Aside from each drum being a different color, Slam-Gs' current Yamaha kit isn't all that different from the one he used during his stint with the Providence, Rhode Island, fusion outfit T.O.J. He opts for compact drums, tuned relatively tightly. "Smaller toms 'sing' a little more," he says. "I go for 8", 10", and 12" on the top, 14" and 16" on the floor and a 22" bass drum." The only recent change is the snare: "Coming from the fusion school, I was really into super-tight piccolo snares. With machine-gun, singlestroke rolls, you want that definition. But that sound just doesn't work in big venues. It's loud and sharp, but the tone is too short. Now I've really grown to like that warmer sound of my Yamaha Maple Absolute snare." Slam-G's says he doesn't worry that some of his jazz peers may not take his current gig seriously: "There will always be people who don't see pop as an honorable sort of music and I'm not going to try to change their opinions. But now I wonder if I took the wrong way around by learning to solo before I had my pocket down. All the chops won't get you gigs. You've got to be able to just lay it down."